Trogons are colourful, vocal and extremely shy. We have three species of trogons in the India – the relatively common Malabar trogon found in the western and the eastern Ghats, the Red-headed trogon found in the low altitude forests of the north-east, and the extremely rare Ward’s trogon found in high altitude temperate forests in the north-east. Like the two other trogons, the Ward’s also has a peculiar habit of perching on a branch with its back to the observers. 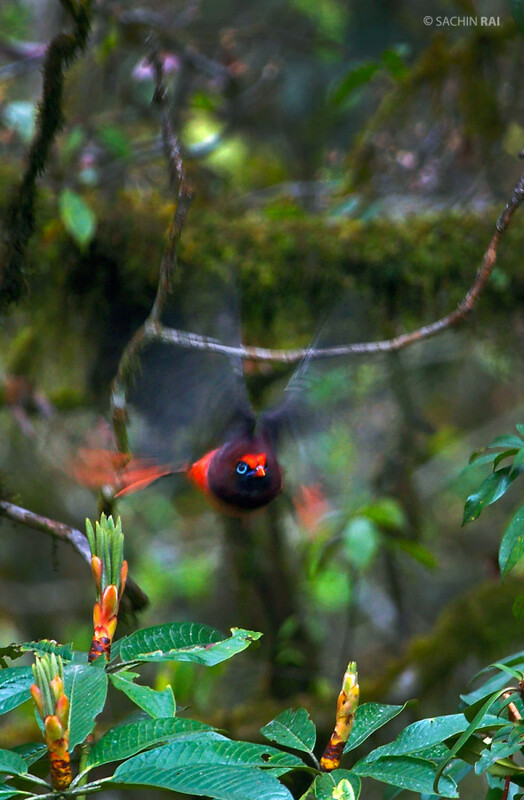 The bright-red males and electric-yellow females are unmistakable but rarely stand out in the thick foliage owing to this behaviour. We spotted this male on its preferred perch, a moss-laden branch. I held out my camera to make a few quick images and suddenly, he decided to take off and fly right over our heads into the dense forest behind us.